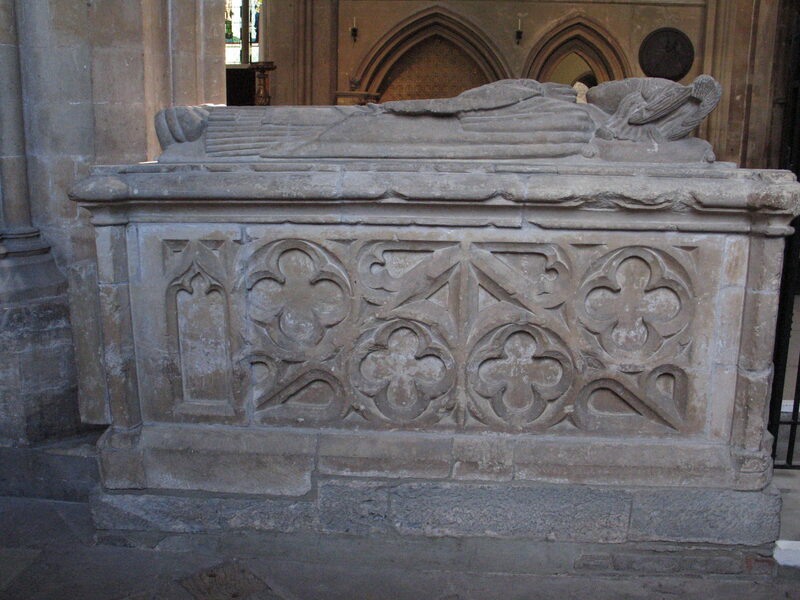 The tomb of Bishop John Marshall (d 1496) in Llandaff Cathedral is at first sight a questionable candidate for Monument of the Month. The effigy is a frankly undistinguished piece of carving. 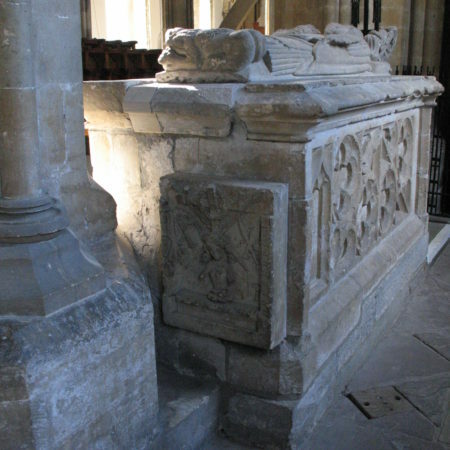 It lies on a plinth which is far too wide for the effigy, on a chest which seems to be made up of scraps of left-over tracery panels, wedged between a pillar and the entrance to the north choir aisle. Stuck on the east end of the plinth is a strange little panel with a very crudely carved Image of Pity surrounded by the Instruments of the Passion. There is no inscription (or at least, no inscription survives) but it is identified as Marshall’s tomb by the coat of arms (now lost) which Browne Willis’s informant William Wotton recorded in 1719. In art as in literature, though, it is often the artistically second-rate which has the most potential for the historian. The Marshall tomb is full of puzzles for the history detective. Unravelled, its imagery can make a valuable contribution to our understanding of late medieval spirituality. Marshall’s tomb is not mentioned in Richard Symonds’ invaluable account of his tour of duty in south Wales in the summer of 1645. It is however marked in its present location and identified as ‘Bishop Marshall’s monument’ by Browne Willis. This is also the location Marshall asked for in his will, ‘in the north part of the steps of the high altar in the choir of the said cathedral church’. When Wotton saw it the tomb had probably already suffered some reordering: the plaque with the Image of Pity was by then affixed to the east end, presumably in its present rather anomalous position near the base of the plinth. However, Wotton described the coat of arms as being ‘in the wall’. By this he may simply have meant the side panel of the chest. However, it is also possible that when he visited the cathedral there was a wall between the pillars north of the choir similar to the wall which still stands south of the choir. Wotton also described a ‘door’ west of the tomb and leading into the north choir aisle, opposite the door which still leads from the south of the choir to the chapter house. This door has now been replaced by a comparatively modern wrought iron gate. 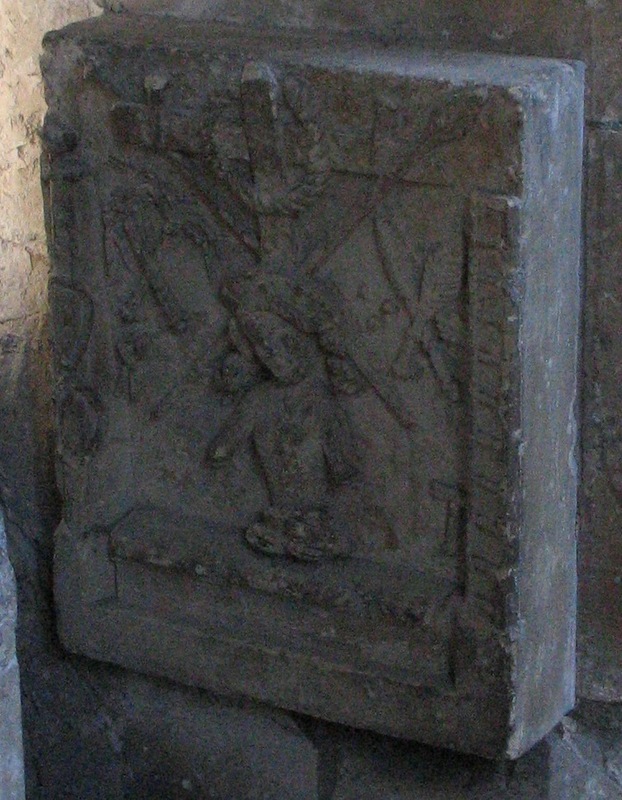 The west face of the tomb chest has a pilaster, scored at the top and with patches of mortar. This could have continued up to form an arch within which a door could have been set. Crudely carved though it is, the effigy is full of interest. The bishop is shown in full pontificals, his crozier tucked into his right arm. His eyes are clearly wide open. His hands are raised, not in prayer or blessing but held slightly apart in adoration. What is he looking at? 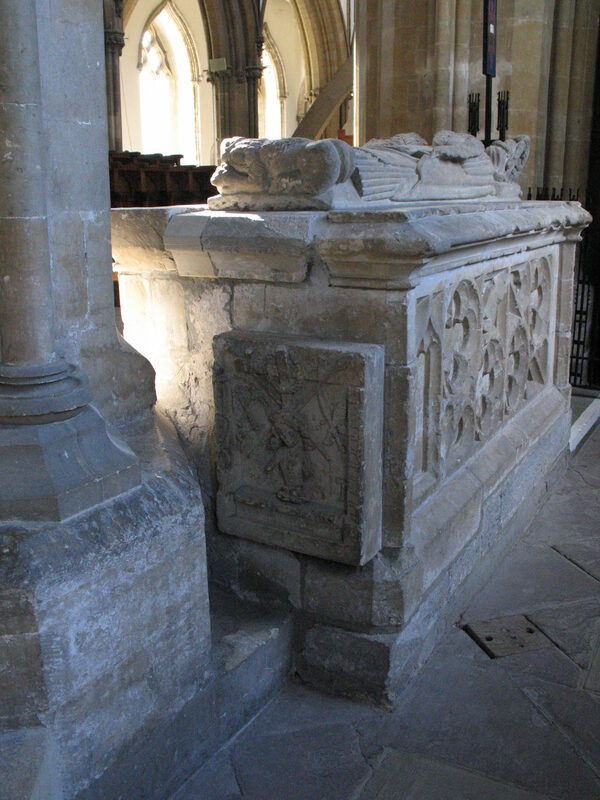 After the British Archaeological Association visited the cathedral in 2004, Philip Lankester and I had a lengthy and illuminating email correspondence about this tomb. 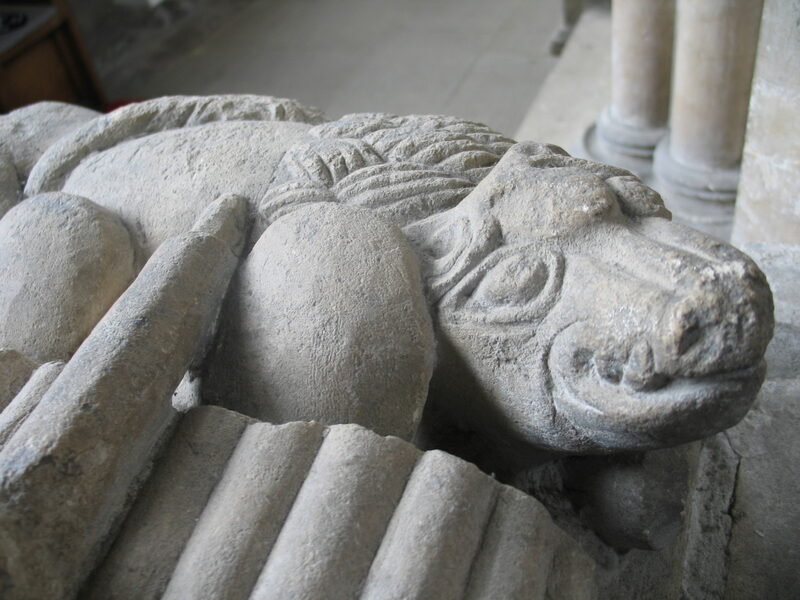 Philip’s initial suggestion was that the effigy might originally have been destined for the alcove tomb in the north wall of the north choir aisle which now houses an effigy traditionally identified as Bishop Edmund Bromfield (d. 1393). 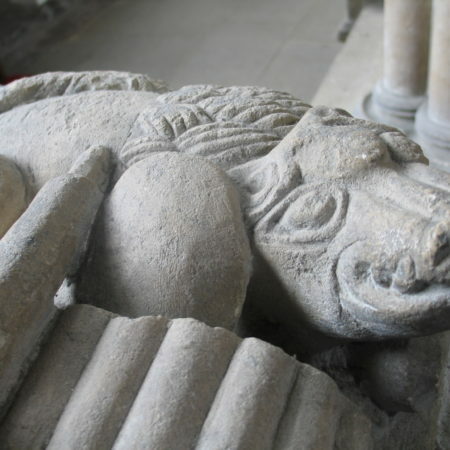 The effigy is in fact about a hundred years earlier in style (for a detailed analysis see Rhianydd Biebrach, ‘The Medieval Episcopal Monuments in Llandaff Cathedral’, Archaeologia Cambrensis 159, 2010). 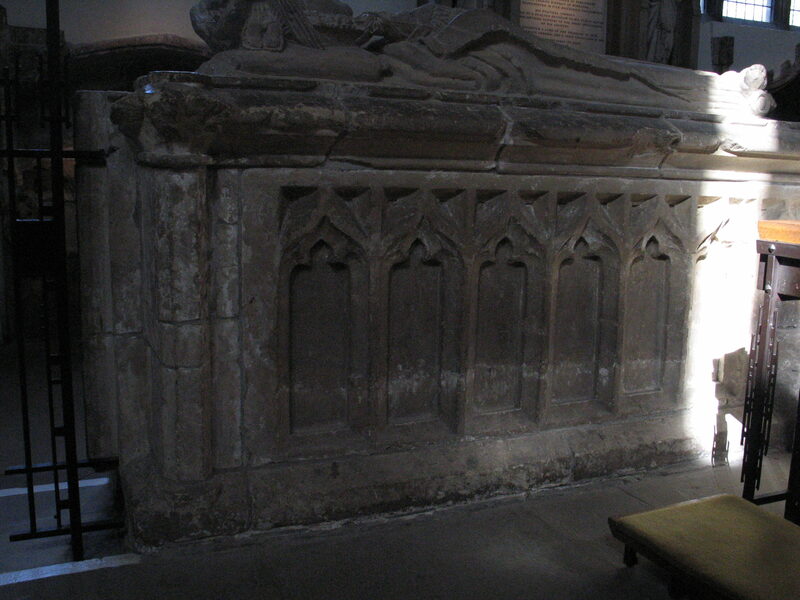 The niche, though, is later, probably fifteenth century, and incorporates a carving of the Image of Pity in the eastern soffit of the arch as well as a plaque of the Instruments of the Passion on the back wall. We wondered whether the Marshall effigy might have been designed to look at the Image of Pity. But the alcove is some way away from the altar steps, and Marshall is carved looking at something immediately above his head. The tomb chest in its present form is clearly a patchwork and has presumably been reconstructed at least once. It is possible, though, that the plinth on which the effigy rests is part of the original. At the four corners are pillar bases, those at the east end being scored and with traces of mortar. These could have supported a tester over the tomb. This might also explain the unusual width of the plinth. It is at least possible that the plaque of the Image of Pity was originally incorporated in such a tester, vertically above the effigy and hence within its direct field of gaze. There are analogies in tombs elsewhere. 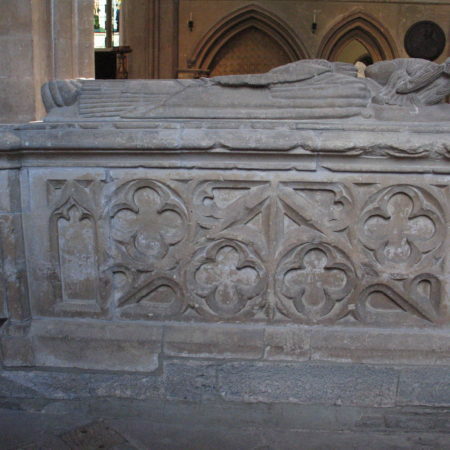 The effigy of Bishop Walter de Stapledon in Exeter Cathedral looks up at the Image of Pity painted on the tester of his tomb. At Long Melford in Suffolk the effigy of the rebuilder of the church, John Clopton, looks up at a standing figure of the resurrected Christ, blood streaming from his hands, feet and side. The Llandaff plaque is less graphic in its present form but it is of course quite likely that it was originally painted. 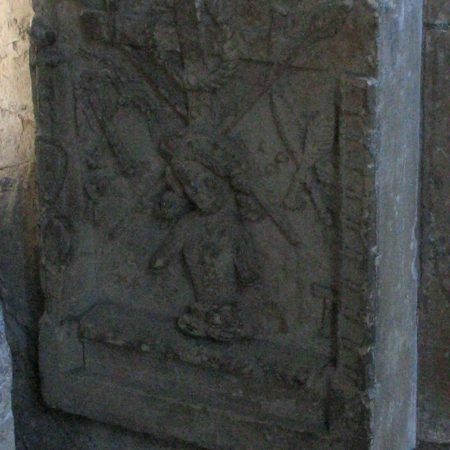 Crudely carved though it is, this little plaque has a very full enumeration of the Instruments of the Passion. As well as the hammer, nails and pincers, the spear, the cross and the crown of thorns, it depicts the cockerel on the pillar, the scourges, ladder, dice and sponge, and the palms of the Entry into Jerusalem. 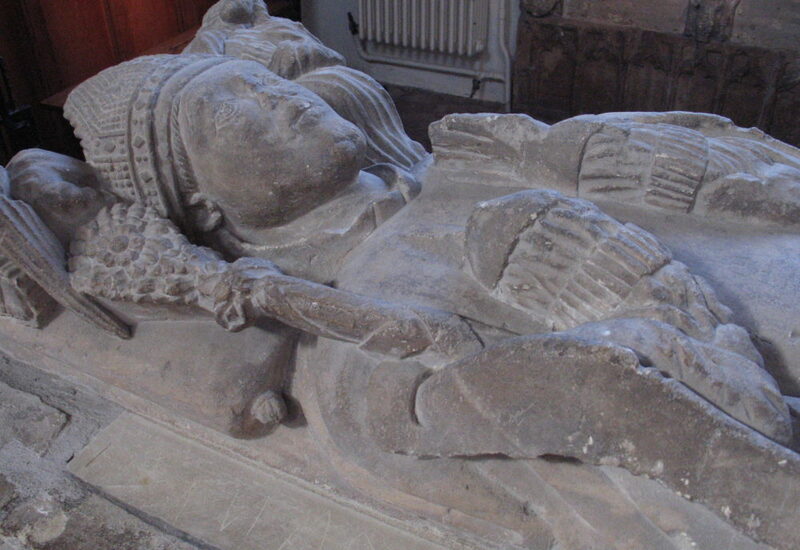 It also has a hand upraised to strike, though not the sword, the money-bag, the seamless robe and the pestle and mortar which appear on the ‘Bromfield’ tomb. We are perhaps especially prone in Wales to read depictions of Christ’s wounds and the Instruments of the Passion through the refracting lens of our Nonconformist heritage of hell fire and damnation preaching and to assume that they are intended to inspire guilt and fear. As the Book of Revelation warns, ‘Behold, he is coming with the clouds, and every eye will see him, all who pierced him; and all tribes of the earth will wail on account of him’. But John Marshall’s ecstatic expression and the text on the Clopton tomb make it clear that the Image of Pity is an image of hope. The resurrected Christ at Long Melford holds a banner reading Omnis qui vivit et credit in me non morietur in aeternum – ‘All who live and believe in me shall not die eternally’. The Instruments depicted on both the Marshall and the ‘Bromfield’ tombs resonated with the Old Testament readings for the Holy Week liturgy: ‘I gave my back to the smiters, and my cheeks to them that plucked off the hair: I hid not my face from shame and spitting’. Marshall’s choice of location for his tomb might even have been intended to place it near the Easter sepulchre, linking his burial with a profound meditation on the twin mysteries of redemption and resurrection. 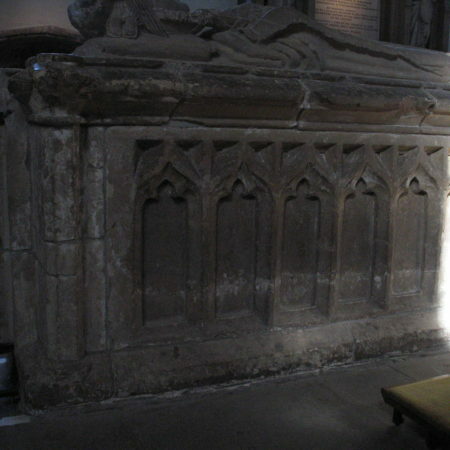 Members will be able to see the Marshall tomb and the other episcopal and lay monuments when we visit Llandaff Cathedral as part of this summer’s conference in Cardiff. We can then explore these ideas further.